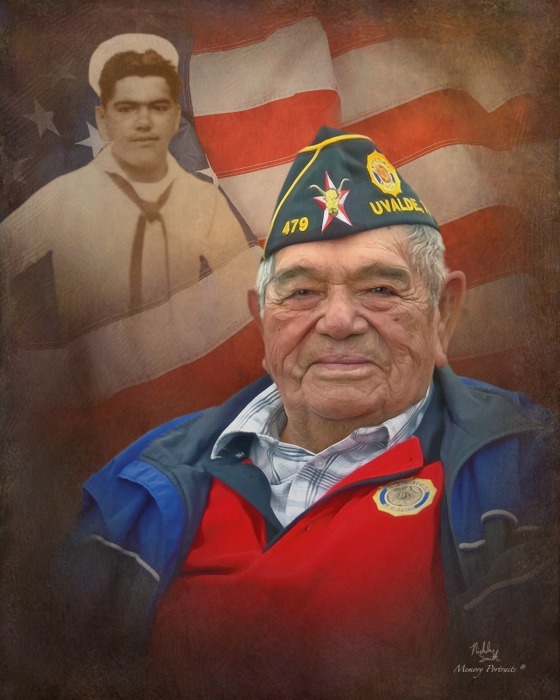 Obituary for Daniel Romo Tristan | Rushing-Estes-Knowles Mortuary, Inc.
Daniel Romo Tristan, 93, of Sabinal died on March 20, 2019, at his residence. A visitation will be held today at 8 a.m. and a rosary will be recited at 7 p.m , at Rushing-Estes-Knowles Mortuary in Sabinal. A celebration of life mass will be held tomorrow at 11 a.m., St. Patrick’s Catholic Church, 501 N. Orange St., Sabinal. He was born on Sept. 24, 1925, in Garland, Arkansas, to Manuela (Romo) and Ramon Rosales Tristan. He married Natalia Villasana on May 22, 1946, in Sabinal. The couple raised four sons and five daughters. He was a loving husband and father who expressed his zeal for life through story-telling, his quick wit, dancing and singing. The family says he was a civic-minded man who was influential in community organizations such as the Sabinal Lions Club and Chamber of Commerce. He was Mayor Pro-Tem, served on the Sabinal City Council, and was a board member for the Sabinal Emergency Medical Service. He was a lifetime member of American Legion Post 479. In 1943 Tristan served in the U.S. Navy as a seaman during WWII, where he helped to command the USS Towner (AKA-77), which was a Tolland-class attack cargo ship through the Pacific Theatre. He was on the ship for 16 months. He then worked for the Star Pacific Railroad for 14 years. Tristan was proceeded in death by his wife of 68 years, and three sons, Oscar Tristan, Rojelio Tristan and Macario Tristan. Tristan is survived by his son, Daniel Tristan Jr. and wife, Cindi, of Seguin; five daughters, Irene Ybarra and husband, Rudy, of Sabinal, Irma Ramirez and husband, Danny, of San Antonio, Rosie Ramirez and husband, Tony, of La Coste, Sylvia Ellison and husband, Lee, of Austin, and Sally Reyes and husband, Frank, of Hixson, Tennessee; daughter-in-law, Mary B. Tristan of Houston, widow of Rojelio Tristan; and numerous grandchildren, great-grandchildren, and great-great-grandchildren. Yesterday, visitation was held at noon and a rosary was recited at 7 p.m. at Rushing-Estes-Knowles Mortuary of Sabinal. In lieu of flowers, memorial donations may be made to American Legion Post 479, 583 W. Main St., Uvalde, TX 78801.